Burnt Corral Campground is located on the upper end of Apache Lake just off of the Apache Trail, a scenic route that links Mesa and Roosevelt Lake. Along the way you will pass historic Tortilla Flat and nearby Canyon Lake. The drive alone is worth the trip along the Apache Trail. RV's may be too large to take as the switchbacks can get pretty tight in some places. The trip is much easier in an SUV. The maximum vehicle limit is 40' on the Apache Trail. Apache Lake Marina has some supplies including fishing gear, a public phone and boat rentals. Watersports include windsurfing, fishing, skiing, personal watercraft, hiking. There is a paved boat ramp located at the campground along with a fish cleaning station and a courtesy dock. 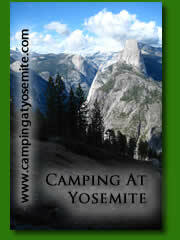 The campground is wheelchair accessible and all camp units and trails are made of compacted gravel. 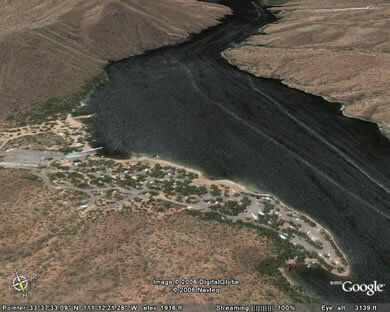 A boat is not needed but will increase your chances of landing a fish at Apache Lake. Rainbow trout, largemouth and smallmouth bass, crappie, sunfish, channel catfish and flathead catfish are all present in Apache Lake. From Apache Junction Drive north on State Hwy. 88 for 38 miles to the F.R. 183/Burnt Corral Recreation Area junction. turn left and follow the road to the campground.